See more objects with the tag airplanes, digital, flight, colorful, data visualization, North America. This is a Data visualization. It was designed by Aaron Koblin. It is dated 2005–08 and we acquired it in 2014. Its medium is video made with processing, adobe after effects, maya. It is a part of the Digital department. Flight Patterns is a data visualization project that traces domestic airline traffic during a single 24-hour period over North America. Flight paths, using datasets provided by the Federal Aviation Administration, are rendered as arced trajectories. 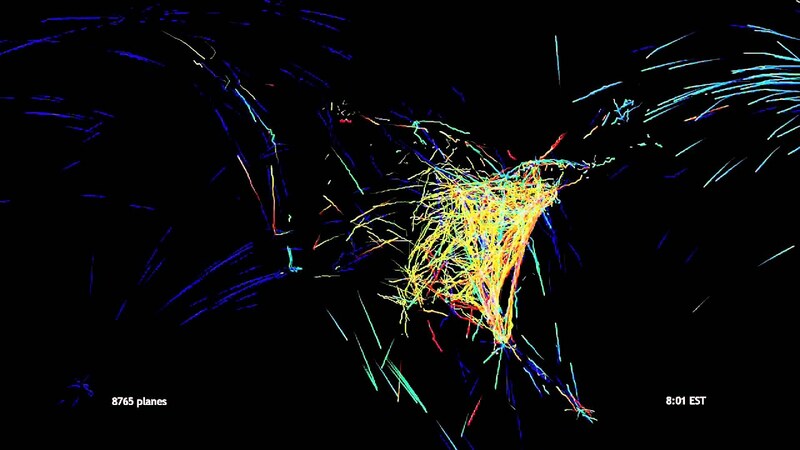 The result is a stunning visual animation that elegantly renders air traffic data as cartography. This object was featured in our Object of the Day series in a post titled Flight Patterns. This object was donated by Aaron Koblin. It is credited Gift of Aaron Koblin. This object was previously on display as a part of the exhibitions	Making Design: Recent Acquisitions and Making Design.